[UV400 PROTECTION]: UV400 Lens protect your beautiful eyes from harmful UVA and UVB rays during your explorations. [SUPER LIGHT SUNGLASSES]: Lightweight and flexible material make the eye-wear suitable for your daily life. [TRANSPARENT CLEAR LENS]: These lens use plastic material, so it\'s tough, lightweight, scratch resistant, and have 100% high visible light perspective to make your vision clearer. [CAT EYE DESIGN]: Classic shape looks great on everyone. The fashion design exudes a elegance making it fashionable in any era. It\'s not bad to choose as a Christmas gift or Thanksgiving gift. 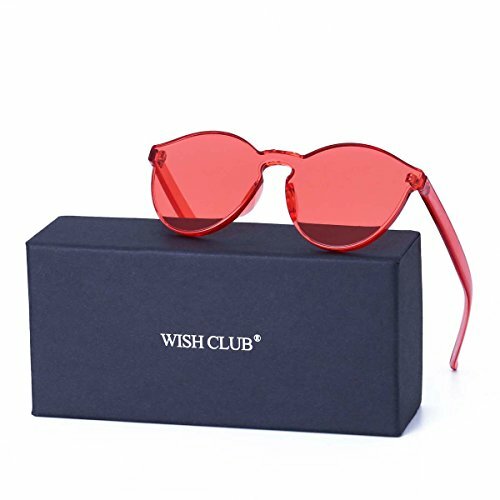 [PACKAGE & 30 DAYS GUARANTEE]: 1 pair of Sunglasses, 1 Case, 1 Cloth Bag, 1 Cleaning Cloth/ Contact seller of WISH CLUB directly if any product problems happen within 30 days.